Whats it about? A heartfelt tribute to daredevil Carl Boenish, a skydiving filmmaker who is credited with inventing BASE Jumping. For certain movies, everything you need to know can be found in the title. A clear concise title can immediately signal to a prospective audience exactly what they are going to be seeing. 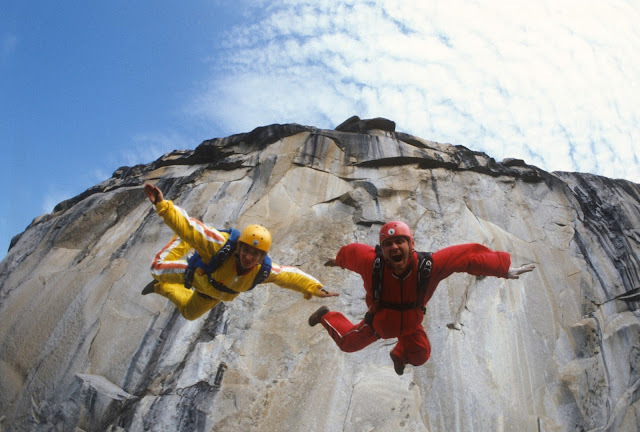 'Sunshine Superman' was one description applied to pioneering 1970's BASE jumper Carl Boenish (rhymes with 'Danish'). That description fit him to a tee. Certainly after listening to family and friends recall how his boyish charms and continuous contagious enthusiasm struck all of them in such a positive manner means that, although his fate is already known, we cannot help but admire this genuine and remarkable man for his groundbreaking work in the risky business of jumping off places and things which hadn't been attempted previously. One of the key aspects of his career was that in trying to convey his bubbling enthusiasm for skydiving, he wanted many others to be able to fully understand and experience what he got out of making so many jumps from an aircraft. He achieved this by pioneering the use of filming as many jumps as possible with crude, but effective head-mounted cameras that gave others the opportunity to actually see what a skydiver sees. Successful with bringing skydiving to a wider audience, he and fellow skydivers, after many thousands of jumps, soon began to think of trying a jump off something other than a moving aircraft. The first place they tried was 'El Capitan' in Yosemite National Park. When the Park Rangers finally put a brake on that activity, Boenish's group then tried a variety of other tall landmarks such as Radio/TV towers, bridges, then ultimately buildings. Looking to give their fledgling movement a name that best reflected their wide range of jump sites, one of the members came up up with the perfect acronym - BASE (Buildings, Antenna, Spans, Earth). Now armed with a credible brand name, base jumping skyrocketed in popularity as the various base jumpers (inevitably lead by Boenish - and his with Jean) upped the stakes by increasing the risk factor with the incredibly daring assaults on many seemingly unthinkable options. The culmination was a world record attempt in 1984 off a daunting mountain range in Norway, the formidable 'Troll Wall' near Andalsnes. Successful and fully documented by David Frost, that should have been that, but a few days later Boenish felt the urge to try for another descent on a previously rejected jump point. As is invariably the case, the desire to keep on pushing to conquer your elements, can lead to somewhat questionable decision making. Alas, this decision in retrospect was to prove fatal, thus ending Boenishs' life prematurely. I've read some reviews where the writers criticize the film for not giving a more rounded picture of Carl Boenish, to my mind, they've missed the point. His life was BASE Jumping/Skydiving. That was his passion, he died doing exactly what he loved. That really is all we need to fully understand the mindset of this most passionate man who lived for one reason alone. To feel truly alive.